If you’d have told me a year ago that Plants vs. Zombies, the mobile tower-defense title was going to be a third-person shooter, I would have scoffed at it. In fact, when it was announced, I did. I wrote it off as licensed content and a cash grab based on the popularity of the mobile game. Although a small part of me held curiosity, I suppressed it and moved on, especially because Garden Warfare was only on the Xbox One. Now that we’ve got Plants vs. Zombies: Garden Warfare on PlayStation consoles, I’ve had the opportunity to put my scoffing to the test, and I’ve been forced to drastically adjust my original stance on the game. The most noticeable thing from the beginning is how detailed and beautifully rendered all of the characters are. From each one of the plants, to the hordes of undead, the level of detail is far above what I would have imagined. The sunflower’s petals wave gently as you walk; the leaves that make up the feet doing an amazingly fluid little scurrying motion. The engineer zombie sports a surprisingly realistic plumber’s crack, and his saunter is just that of a determined, yet undead, being. The level of detail isn’t just limited to the characters, as the levels are all also fun, colorful, and interesting. Each one feels extremely unique and they each offer separate obstacles and challenges. Garden Warfare is one case in which I would say the timed exclusivity worked in the favor of the second release. PopCap and EA have been hard at work fine tuning the game, adding content– for free, mind you — and otherwise supporting Garden Warfare since its release on the Xbox One in February. What this means is that PS4 owners are getting the tuned, full featured release, with more content planned to come! This kind of dedicated support is important for maintaining the player base of an online-only title and they are bringing it in spades (no, spades is not meant to be any kind of pun about gardening tools, though now that you mention it…). It also means that all players are kept in the same pool. No one has any kind of unfair advantage and there are no queues specifically for the DLC levels and modes. All content is added equally for everyone. Content and graphical fidelity mean nothing, however, if the game isn’t good. In Garden Warfare’s case, there is no need to worry. Each of the character classes is extremely unique. When asked what my favorite class was, I couldn’t decide. Each class on both sides has varied abilities and stats that make every character very fun to play as. The Chomper is the melee tank class for the plants, but can be subverted by the Engineer riding his jackhammer or using a stun grenade. The Sunflower is the plants dedicated healer and is faster than any of the other flora. Each side has what equates to Soldiers, Healers, Tanks, and Snipers, but even the Healers on each side differ enough that playing as the Scientist is a completely different experience than being the Sunflower. No single class feels overpowered, and every character and ability plays a part, which makes Garden Warfare immensely fun to play online. 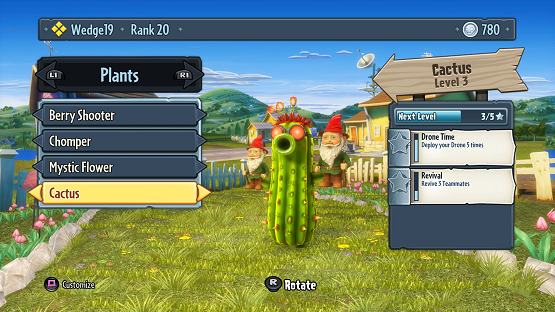 There are a myriad of game modes that fully utilize each of the character’s unique traits as well, from the co-op Garden Ops mode that sees four plants defending a garden from waves of zombies, to Team Vanquish, which is a standard team deathmatch style of game. My personal favorite right now is Gardens and Graveyards. The plants hold six gardens which the zombies need to capture one after the other. If the plants manage to hold the zombies back on one, the game ends. If the zombies capture a garden, the plants must fall back to next garden and attempt to stop the zombie push again. Have I mentioned that these competitive matches feature 24 players, meaning that each team can have up to 12 plants/zombies? In addition, the maps are perfectly sized to house this number of players without making it feel crowded or like everyone is too far apart. Competing in any of these modes earns you coins that you can use to buy sticker packs, which contain character customization options and upgrades. The number of options for each character are staggering. My Cactus previously had gnomes for arms, and now sports a couple of donkeys! 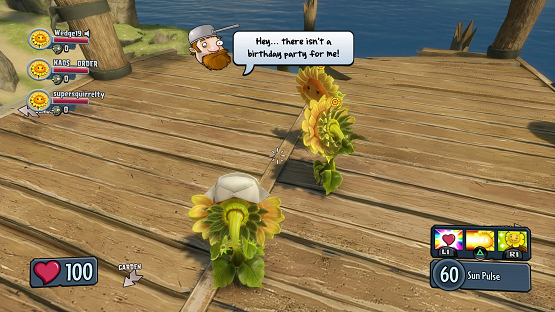 My Sunflower wears a nurses cap to denote her the group healer. My All-Star (football player zombie) has a raw pork chop for an eye patch, because why not? Each class also has alternate characters that have their own slightly different stats and abilities, in case everything up to this point wasn’t enough for you. The Mystic Sunflower is a glowing Sunflower that has slightly more powerful attacks. The Hockey-Star is the All-Star with a more powerful weapon that overheats faster. Each of these subtle nuances tweak the character classes just enough that everyone can find their perfect match– but you’re going to have to unlock them first. I do have a couple of minor irks with Garden Warfare. While there is a split screen co-op mode, it is relegated to being an endless version of Garden Ops, and you cannot play online. I would have loved to have my wife join me in online games of Garden Ops, or even jump onto my team in a huge game of Gardens and Graveyards, but at this point, the split screen co-op feels like the most forced and out of place feature in the game. Don’t get me wrong, it’s still a ton of fun, but I feel like it could be more. I also had periodic problems with getting kicked from EA’s servers. When all of your data is stored online, this results in not being able to access anything in the game, including character customization, until you can reconnect– which I was always able to do immediately. These online requirements may be enough to wilt people’s excitement for the game, but if internet is traditionally not a concern for you, this point really shouldn’t make a difference. Plants vs. Zombies: Garden Warfare is a game that should not go unappreciated. 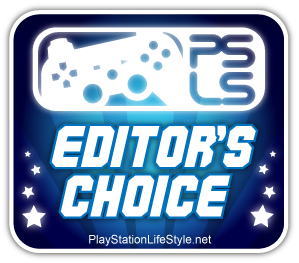 There’s a little something for everyone here and even if you don’t particularly enjoy online shooters, you ought to give this one a shot. While the lack of a more robust split-screen and internet requirements may turn some people away, but I urge these small factors not to impact your decision to check this game out. It is an amazingly fast, fun, and deep title, and with persistent support going forward, I can only see Plants vs. Zombies: Garden Warfare continuing to get better for the community. 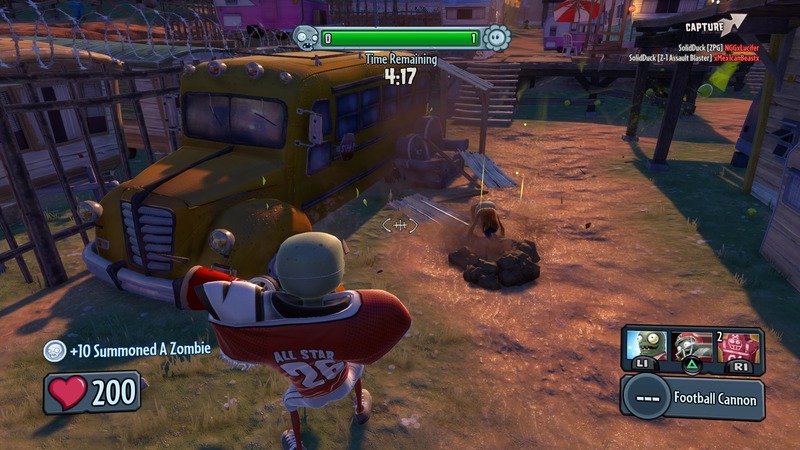 Plants vs. Zombies: Garden Warfare review copy provided by publisher. For information on scoring, please read our Review Policy here. Characters are all extremely unique in visuals and play styles. Tons of customization and unlocks. Detailed character models and environments. Internet connection required for everything beyond the main menu.